If your community is planning, building, or renovating a playground, chances are there’s a big gap between your vision and what your budget will allow. Don’t despair! You may be eligible for grants you aren’t even aware of. There are also community fundraising opportunities that anyone with a little time, effort, and perseverance can leverage to turn that dream playground into a reality. Paying for playground equipment, site upgrades, shade, shelter structures, safety surfacing and outdoor fitness equipment may seem daunting. The first thing to realize is that the funding is out there — it’s just a matter of finding it. Don’t leave money on the table, and don’t settle for less than what your community needs. To that end, here are some funding resources and fundraising ideas. We hope they’ll be useful to parks and recreation administrators, and anyone else looking for creative ways to make their vision of safe play come to life. Community fundraisers like raffles, bake sales, and car washes work for some organizations. However, for others, they’re more trouble than they’re worth. Special events to raise funds typically work best when you first make sure you have enough volunteers and community awareness (promotion) to make the endeavor a success. Make the event fun and keep the message about the playground you’re working to build and the kids you’re trying to help. Community members are much more likely to spend money when they are reminded it’s for a good cause! If you decide a fundraising event is the way to go, include local religious groups and service clubs in the planning process. Even if they can’t donate money, they have networks in place to recruit volunteers and offer other resources (such as hosting locations or newsletter lists for promoting your event). Funding for the most ambitious civic projects often starts with individual donors and local businesses. You can solicit cash donations through direct mail campaigns, phone calls, and even door-to-door. Give residents a feeling of attachment to the project. Local businesses are usually more likely to “sponsor a new swing set” than they are to simply hand over the equivalent cash amount. So be creative and emphasize to your community that they’re making an investment and not just throwing money away. Don’t forget about “in-kind donations” that local professional service providers may be able to offer. These include marketing and public relations services, grant-writing services, accounting services, and more. Finally, be sure to involve children in your fundraising efforts. It will teach them valuable life skills as they lend a hand in making the playground project a reality. It will also remind everyone involved who the playground is ultimately for! Local mom-and-pop businesses are fantastic, but corporations have the budget to make your playground possible. Business partnerships on a larger scale will require some homework, and you’ll have a lot more hoops to jump through to get them to loosen those purse-strings. Learn about the businesses you’re going to approach and find out if they’ve historically supported projects like the one you’re planning. When approaching corporations for sponsorship, you’ll need to make sure you’re reaching out to the correct person. If they’re big, they may have a community outreach person, or even an entire department focused on civic investment. Just like any individual, businesses want to know “what’s in it for them,” so keep your pitch focused on the benefits their organization will see should they choose to underwrite your project. What might those benefits be? One perk could be including the positive brand association and publicity they’ll get having their company name associated with the playground after completion. You may even be able to tie your project goals in with the company’s mission statement and philanthropic strategy. Federal and state governments and countless private foundations have grants available to schools and non-profit organizations seeking to build and renovate playgrounds. Research is the key to finding the right foundation to approach. The grant application process can be intensive and lengthy, so the best time to start is now! Detailed financials including : a list of current funding sources, an itemized budget for your proposal (which consists of specifics about how you will spend the money), and information about your organization’s current and past finances. If applicable, add proof of non-profit 501(c)3 status, as well. You may also want to include photographs of your existing playground (if you’re seeking funding for a renovation) or of the site selected for your planned project. If there are any opportunities to name the playground after a donor, mention that as well! Again … Investors want to know what’s in it for them. With all this information assembled, you’re ready to begin writing the actual grant application. This will generally include an executive summary, a statement of need, a project description, a budget, and a conclusion. A great cover letter will introduce your project and compel funders to read more. When writing it, stay focused on the audience (the foundation to which you’re applying) and remember to convince them that funding your project aligns with their mission. Heads-up: There may be a standard proposal format in your state, which will let you prepare one document and submit it to several agencies (with minor changes). KaBOOM! is a national non-profit dedicated to bringing balanced and active play into the daily lives of all kids, particularly those growing up in poverty in America. Sign up to receive emails about grant opportunities at their website. The Peaceful Playground Program introduces children and school administrators to new ways of looking at the possibilities of playground activities. Their listing of playground grants will help secure funding for your project. SPARK is a research-based program of San Diego State University Research Foundation that promotes lifelong wellness programs. The SPARK Grant-Finder Tool will help you find funding for your programs related to physical education. The Grants.gov program is managed by the Department of Health and Human Services and is a great place to start learning about how to apply for federal grants. Their search function lets you search for grants by keyword. When you’re ready to design and install, No Fault Sport Group can help your school or park achieve your vision. 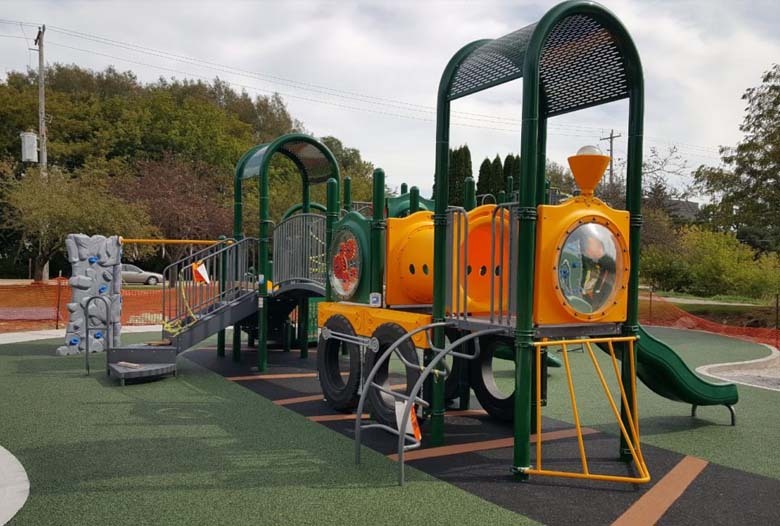 We work with parks and recreation departments and playground equipment manufacturers to provide the industry-leading safety surfacing products that keep kids safe.